San Diego, CA (November 20th, 2013) – Today, IDW Games announced it had signed J.K. Woodward and Dave Dorman to be the art team for their launch title, Kill Shakespeare. Woodward’s work has been a mainstay at IDW since 2005, where he helped relaunch Fallen Angel before moving on to various Star Trek series, including last-year’s best-selling Star Trek: The Next Generation/Doctor Who maxi-series. 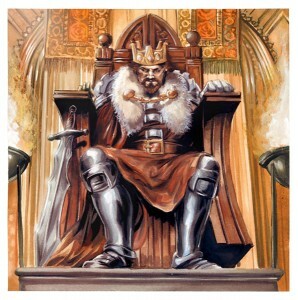 Dave Dorman is an Eisner Award-winning artist known for his extensive work in the fantasy genre, including Star Wars, Indiana Jones, and much more. Woodward has been brought on to create the art that will be featured on the playing cards for the game while Dorman will paint an original piece for the Kill Shakespeare box’s art. This debut title has a planned release date of June 2014. With a release date of next summer, the news is starting to heat up for IDW Games. Fans can go to www.idwgames.com and subscribe to a newsletter that will keep them up to date on all the latest announcements and developments. This entry was posted in Columns and tagged Conor McCreary, Dave Dorman, idw, J.K. Woodward, kill shakespeare, star trek. Bookmark the permalink. Follow any comments here with the RSS feed for this post. Post a comment or leave a trackback: Trackback URL.